When the first hydraulic steelworkers became available, they were a blessing to an industry that did a lot more than its fair share of drilling and punching metal plate. The basis of many construction and engineering projects, steel and aluminum plates of substantial thickness may need to have bolt-holes and cutouts formed to a high degree of precision. 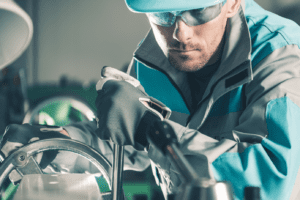 That might be manageable as a manual task on a few plates, but if the contract is for high volumes, you not only have a job that is time consuming but also tedious, and since high precision is always required, it would normally mean tying up a skilled engineer on the job. On large scale productions, this doesn’t make any sense at all, and the introduction of the Morgan Rushworth HSP CNC punching machines couldn’t come quick enough! The HSP CNC punching machines take the hard work out of punching holes in plate, and offer a high degree of precision that is difficult to match with traditional marking and drilling or milling processes. Available in models up to 175 tons, the Morgan Rushworth HSP CNC steelworker is an effective means of punching precision holes and shapes, and reduces the monotony of repetitional marking, which could be a long operation and subject to human error. 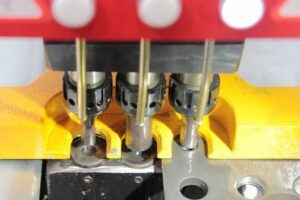 But the traditional punching machine isn’t the whole solution; while they are an effective means of punching holes and shapes, it still requires manual marking out and set up. 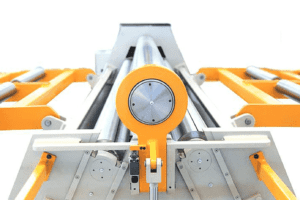 The addition of computer numeric control (CNC) turns the traditional punching machine into a fast and credible means of producing multiple plates and fixtures in the minimum time. CNC plate punching machines are now the tool of choice for the professional workshop. The advantages of CNC are obvious. Programs are stored and can be called up as needed, delivering high speed application and precision to the tiniest element as standard. Therefore, a company can hold many hundreds of different hole and pattern designs, ready to be accessed as soon as they are required. The negatives of manual marking is that if the hole spaces are incorrect it would mean a disaster on site when bolt positions don’t align. CNC punching machines offer huge advantages in the two most important fields of metalworking; speed and precision. Speed is evident in all areas of the operation, from hole placement to changing hole dimensions without changing the tools. 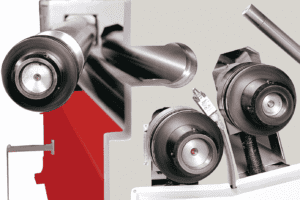 The triple head punching system allows three tools to be loaded at one time enabling three hole dimensions to be used in any program. With a CNC program stored in memory, there is no need for laborious and potentially incorrect marking-out. All that means a high throughput of exceptional quality goods in the fastest time possible. Furthermore, once fully trained, CNC machines can be run without the input of your skilled workforce.